Advanced Basement Systems is a PolyLevel® contractor, serving Chatham, London, Sarnia, Windsor and surrounding Ontario areas. Schedule your consultation with one of our commercial technicians today to learn how we can lift your sunken concrete slab using our fast, durable, cost-effective solution. Concrete raising for roads, bridges, highways, railroads & runways. Serious safety hazards occur when these concrete elements sink, so repairs must be made right away. Advanced Basement Systems often relies on polymer injection or polyurethane concrete lifting to raise sunken concrete roads and runways. The main advantage with this technique is that the injected polymer cures to about 90 percent of its final strength within an hour after injection, enabling the road or runway to be used quickly. Advanced Basement Systems is your local expert for commercial foundation repair. Contact us today to schedule an on-site consultation to find out how PolyLevel® can solve your all your concrete problems, and we will provide you with an estimate for your commercial project. 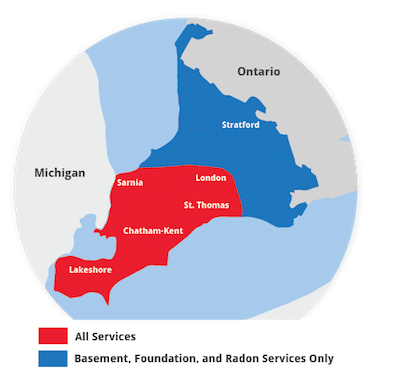 We proudly service Leamington, St Thomas, Windsor , Stratford, Essex, Strathroy, Amherstburg and many surrounding neighborhoods.